These vehicles and accessories will keep things moving around your warehouse. Robotic lift truck: The world may be buzzing about how robotics will revolutionize the warehouse, but for distribution and logistics managers, it can be hard to know where to start. 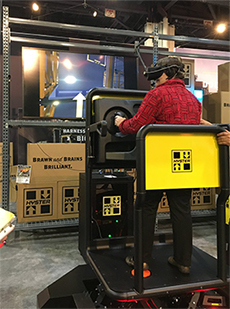 Hyster Co. provided one example of an entry point for companies looking to "stick their toe into robotics" at this year's Modex show. The forklift company demonstrated its robotic lift truck solution, which adds robotic capabilities to existing Hyster forklift trucks. The tower on the back of the lift truck is wired with a camera and sensors that allow the truck to work without a driver for those 10 to 20 percent of actions that are routine and repetitive. 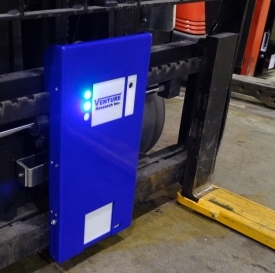 Forklift reader: Venture Research Inc., a global supplier of RFID (radio-frequency identification) and IoT (Internet of Things) solutions, has unveiled an "intelligent" industrial forklift reader. Designed to autonomously manage a pick, drop, stack, and move operation using an array of RFID and IoT sensors, the new reader can withstand both indoor and outdoor harsh environments, the company says. With the swappable rechargeable lithium-ion battery, the reader can be quickly installed to full operation in just five minutes on a standard type 2 or type 3 carriage forklift. The forklift reader can sense its environment and autonomously manage the complete pick/drop/stack operation while providing store and forward transactions directly to the cloud via Wi-Fi or optional cellular communications. Built-in location tracking that incorporates GPS, RFID, and IoT (BLE) provides positional awareness of the forklift in real time. Specialized lift truck forks: Lift truck attachment company Cascade Corp. has unveiled a new line of specialized forks. Known as "Forks+," the line consists of weigh, telescopic, and roller platen forks. The weigh forks automatically weigh and display the weight of pallet loads of up to 10,000 pounds. The weight information can also be communicated to the user's warehouse management system (WMS). Telescopic forks, or hydraulic fork extensions, allow lift trucks to load or unload trailers and trains from the side or allow a standard lift truck to be used in place of a reach truck. Order pickers: Toyota Forklifts has introduced three new order pickers. 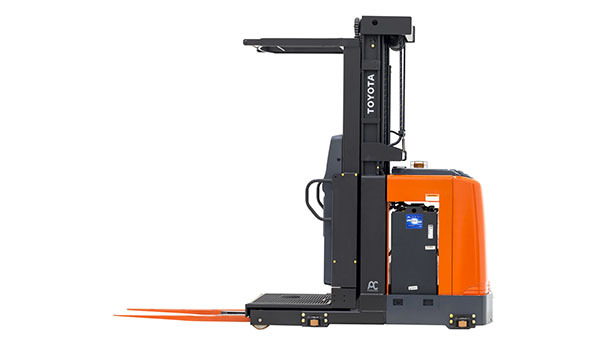 The new models feature Toyota's optional Lift Logic Speed and Height Control System, which enables fast and easy picking, the company says. The line includes Toyota's first model in the class to offer a 36-volt option with a reach height of up to 390 inches. The three new models come equipped with AC drive, and two models come standard with AC lift. The entry-level model is a 24-volt that lifts up to 240 inches. The mid-level model is also a 24-volt and lifts up to 366 inches with faster lift speeds than competitive 24-volt models, the manufacturer says. The premium-level model is a 36-volt and lifts up to 390 inches. Forklift caster wheels: For companies tired of spending hours and money to replace caster wheels on their forklifts, Caster Concepts has come up with a solution: heavy-duty maintenance-free casters. Maintenance-free casters have precision neoprene-sealed ball bearings and hardened raceways, ensuring smooth rotation for several years. The kingpin-less design and thick forged steel can withstand shock loading and side forces, the company says. 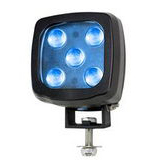 Zone lights: To alert pedestrians to the presence of a forklift, Larson Electronics offers LED zone lights in red and blue, as well as LED strobe lamps. The company's forklift safety lighting units operate on low voltage and come with flexible mounting components, such as magnetic mounts, brackets, and clamps. These features enable forklift operators to secure the lights on racks and frames. 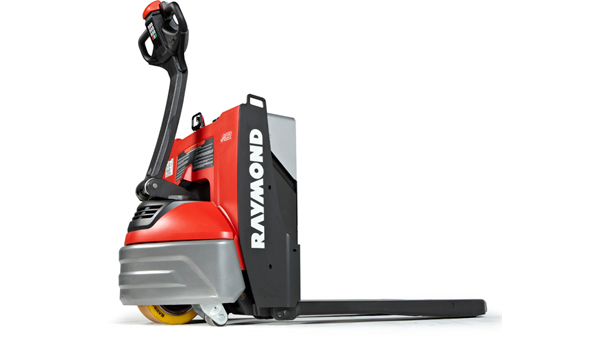 Pallet truck with Li-ion battery: The Raymond Corp. has introduced the Model 8250 AC walkie pallet truck with 24-volt 156 ampere-hour light EV battery pack. Built specifically for the Raymond Model 8250, this double-power-capacity lithium-ion (Li-ion) battery pack has been UL 2271 listed. The Model 8250 with Li-ion battery provides CAN (controller area network) communication that allows data exchange between the truck and battery pack, providing operator feedback in the form of fault codes displayed on the truck's control handle as well as audible and visual alarms if charge is required or low. The onboard battery management system allows the user to schedule charge times, provides notifications when charging is required, and monitors charging and usage to prevent overcharging and discharging events. As an added benefit, the power pack includes integrated heaters for superior cold storage needs and thermal controls that reduce the risk of damage caused by environmental extremes. The power pack has been designed to handle rugged environments and is IP65-sealed and maintenance-free. In addition, Raymond's user interface offers the operator a visual representation of the battery's charge state. Feedback: What did you think of this article? We'd like to hear from you. DC VELOCITY is committed to accuracy and clarity in the delivery of important and useful logistics and supply chain news and information. If you find anything in DC VELOCITY you feel is inaccurate or warrants further explanation, please ?Subject=Feedback - : Spotlight on ... forklifts and attachments">contact Chief Editor David Maloney. All comments are eligible for publication in the letters section of DC VELOCITY magazine. Please include you name and the name of the company or organization your work for.